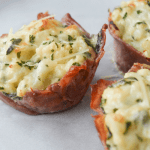 These Keto Three Cheese Cauliflower Mac and Cheese Cups are an easy way to control portions while enjoying a delicious, low carb pasta substitute. Add a couple cups of water to a large pot, place steamer basket into pot above water, and bring to boil. While the water is heating, prepare cauliflower. Remove core and leaves from cauliflower. Chop into bite-size pieces. When water is boiling, carefully add cauliflower to steamer basket. Cover and let steam for 5-7 minutes or until fork tender. Prepare sauce while cauliflower is steaming. When finished, turn off heat and set aside until ready to add to sauce. In skillet over medium-low heat melt butter. Add onion and cook for 2-4 minutes until onion is tender and becoming translucent. Add garlic and softened cream cheese. Softened cream cheese will be easier to smooth into sauce. Using wooden spoon or rubber spatula, press cream cheese flat into pan to help smooth as it warms and gently stir. Pour in heavy whipping cream, seasoning, and xanthan gum. Stir ingredients until smooth, raising temperature slightly if needed to get sauce fully mixed. Add spinach, white cheddar, mozzarella to sauce and turn off heat. Continue stirring for a few minutes, until spinach begins to wilt and cheeses are fully melted and smooth. Using large muffin tin (1 cup capacity) place two slices of prosciutto in X to cover the bottom of the tin and stretch up around the sides as much as possible. It may rip a little, that’s ok. Just be sure the bottom is covered. Place 1/2 cup of cheesy cauliflower mixture into prosciutto cups and top with 1 tablespoon of Parmesan. Bake for 15-20 minutes or until bubbly and brown. Serve warm. SERVING SIZE NOTE: I have not made this in smaller muffin tins. If you do, it will make more servings and you would likely only need 1 slice of bacon/prosciutto per cup. Adjust personal macros accordingly in a program such as My Fitness Pal. It will also alter the amount you need per cup. If specific weight is important to you, place empty bowl on food scale and add cauliflower and cheese mixture. Weigh mixture in grams and divide by 6 to get more accurate serving amount. *xanthan gum is a thickening agent. I added to the cheese sauce to ensure it stayed together in the cups. If you prefer not to eat this ingredient or do not have it, feel free to omit. Sauce may be more runny. **Prosciutto is a dry cured ham. You can find this in the deli section often near the higher quality cheese. Feel free to swap bacon and adjust the cook time and nutrition accordingly. Steaming cauliflower: If cauliflower seems super excessively wet or soggy (this can happen in microwave steamer bags), remove some of the water with a towel or pat down dry. It does need some moisture to complete sauce. I used the Instant Pot for this step. 1 cup of water, cauliflower pieces on steamer rack, close lid and set to “steam” for 1 minute. Quick release pressure. Frozen cauliflower: you may use frozen cauliflower for this but I have not tried it myself so you may need to remove excess water and intuitively adjust the recipe. These cups are large and could easily be a meal. For a side dish, we found sharing one was plenty.